Product prices and availability are accurate as of 2019-04-16 16:24:38 UTC and are subject to change. Any price and availability information displayed on http://www.amazon.com/ at the time of purchase will apply to the purchase of this product. 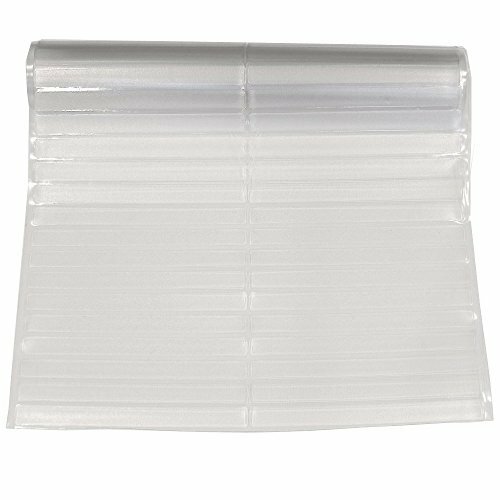 This easy to install, durable, vinyl plastic floor runner will extend the life of your carpeting in high foot traffic areas of your home or office such as hallways, a foyer, living room or office. The ribbing pattern is designed to provide added traction and prevent slipping. Easily cut this plastic mat with scissors or a utility knife to fit your needs. It will lay flat without adhesive but can be secured into place with any vinyl compatible product or two-sided tape. This product does not stick to carpeting. Do not use when wet. It is washable with any household cleaning product. Resilia Plastic Floor Runners protect carpets from allergens carried in from shoes or pets. Allergens are easily cleaned off their surface along with dirt. Carpets and carpeted runners entrap allergens in their fibers and can aggravate allergic symptoms.